Discussion in 'USMB Lounge' started by boedicca, Dec 11, 2014. He certainly has nothing to do with Christianity. That is a fact, Westwall. Thanks for pointing it out as the OP appears to be trying to make a connection where there is none. Jeremiah, I don't think that was the intent of the OP. I think it is a lighthearted look at how Santa is viewed in todays materialistic world.. I specifically reference the Tim Allen observation. Actually what troubled me about it was the history of Paganism is not tied to Christianity but Catholicism and I do not recognize Catholicism as any part of Christianity. So that is my trouble with his OP but I've decided I just won't respond to him again. Thank you for sharing your thoughts with me about it, Westwall. I do not have anything further to say on his thread. Thanks again. Religion threads in the Lounge? Really? I thought that was against USMB rules. I don't think this is a "religion" thread. 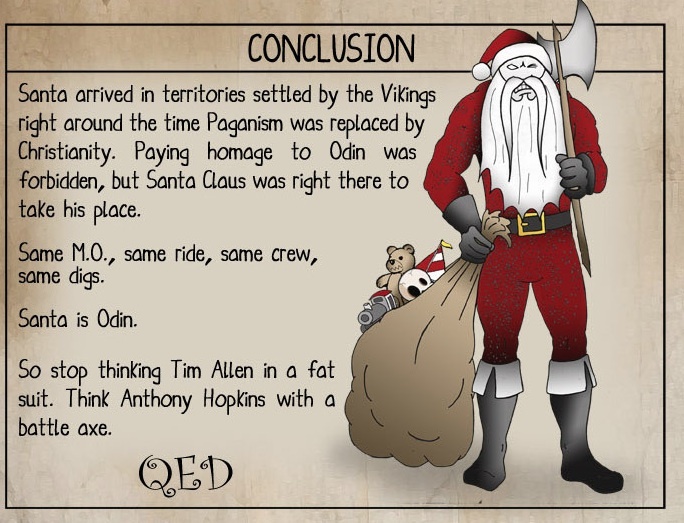 It is more of a light hearted look at who Santa is based on. As Santa is not a religious figure I don't see a problem here. I found it funny and very entertaining and I have no problem with it, but Santa to some is based on St. Nicholas who was a religious figure.